The first book in this series, Still Life, occurs in a small village called Three Pines, full of wonderful characters. I was sad at the end of that first novel with the thought that the next book in the series would find Chief Inspector Gamache in another town with a new cast of characters. I was delighted to discover that this was not the case at all. Once again, murder has come to Three Pines, and I was able to immerse myself in their village once again. Ms. Penny’s writing style pulled me right into the book. One of the Three Pines residents, Ruth, is a poet, and her poetry frequently inspires Gamache while on the case. While dark things have happened to some of the characters, many of them are able to find the light that still exists in their life. Gamache himself appreciates the beauty of the world even more after he has experienced it’s darkness. He felt happy and satisfied. He loved his work, he loved his team. He’d rise no further in the Sûreté, and he’d made his peace with that because Armand Gamache wasn’t a competitive man. He was a content man. Gamache is an interesting character. He is not one who is trying to continue up in the ranks of the Sûreté du Québec. Instead, he is a man who loves people, loves life itself, and is driven to show compassion and justice in his work. Gamache takes the time to know people, tries to gain an understanding of them, and in turn mentors those on his team to do the same. Gamache has a special connection to the residents of Three Pines, forged in his last case with them the year before. 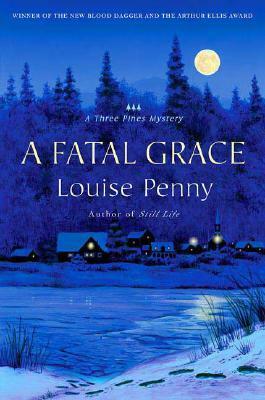 The people of Three Pines bring a nice balance to the murder investigation. Characters are a large part of A Fatal Grace, but the mystery is the driving force. Who was able to kill CC de Poitiers in the middle of a curling match, with absolutely no witnesses? While this is Gamache speaking in the book, Ms. Penny has summed up her style. Gamache patiently follows one clue after the next to find the killer. Some arm chair detectives may piece together the murderer along with Gamache. I will admit that I was surprised at the end. In addition to the murder, we hear bits and pieces about the “Arnot Case.” It seems that A Fatal Grace is setting us up for the next book in the series. Even though this is the second book in the Chief Inspector Gamache series, you should be able to jump right in to this story. Reading Still Life first will give you more insight into the characters, both the residents of Three Pines and the detectives on the case. Particularly the team’s disdain for Agent Nichol.